Margaret K. McElderry Books, 9781442436527, 160pp. Now in paperback, an enthralling account of a young boy’s struggle to help freedom triumph over fear in the 1940s American South. 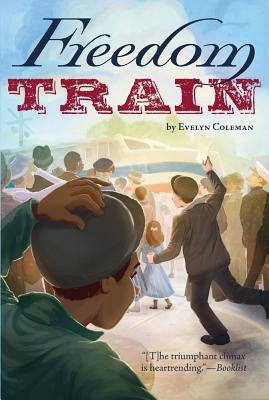 It’s 1947, and twelve-year-old Clyde Thomason is proud to have an older brother who guards the Freedom Train—a train that is traveling to all forty-eight states carrying the country’s most important documents, including the Declaration of Independence and the Bill of Rights. Clyde is chosen to say the Freedom Pledge at the train’s stop in Atlanta, but his terrible stage fright forces him to refuse the honor. Instead, it’s the class bully, Phillip, who gets selected, and he begins to torment Clyde. When an African-American boy saves him from a beating, Clyde is shocked. Especially when he learns that William lives in the white part of town. How can this be? And why can’t he bring himself to be friends with William? Clyde hasn’t told his parents he won’t perform the pledge, nor has he mentioned his confusing friendship with a boy of color. So when the townspeople threaten William’s family, Clyde has a choice to make: Will he keep quiet, or stand up for real freedom? Ideal for classrooms, Freedom Train contains historical photos of the Freedom Train and its guards, as well as an author’s note that provides additional information about the history of the Freedom Train.